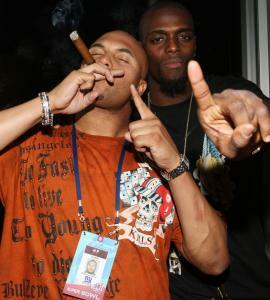 Plaxico and Antonio partying it up the night Plaxico shot his leg! Well, if you thought Plaxico couldn’t screw the GMEN up any more than he already has, your dead wrong. It has just come around the horn that Antonio Peirce will be facing gun charges that could put him in Jail for 3 and 1/2 years. “The DA’s office has confirmed that they are going to seek charges against Antonio,” said Michael Bachner while talking to a prominent New York Newspaper reporter. Without Pierce the New York Giants defense is without doubt softer against the run. If Pierce fails to beat the wrap, the New York Giants could be in for a very long season. This is an abomination, someone has to stop this liberal retarded New York DA. It’s upsetting that we are creating a world where you can’t even help a friend!